Dry and sunny conditions at the High Pasture Cave site and a full week of excavation has resulted in good progress and some new finds, including a granite pebble grinder and deposits of animal bone. Click on the links to find out what has been going on at the site this week. Trench 2 at the High Pasture Cave site is now over 2 metres deep and we are approximately 0.5 metres above the roof horizon in Bone Passage. 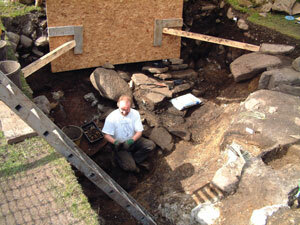 George Kozikowski excavating archaeological deposits in Trench 2. He is pictured here in the lowest part of the trench, where we are finding more unburnt and burnt bone lying between boulders and fire-cracked stone that are forming some form of blocking material into the cave. To the right in the image you will notice that we have uncovered more potential structural elements including paving and what may be the remains of a series of steps leading down towards the proposed entrance into Bone Passage. The stratigraphy at the High Pastures site is quite astounding, the trench is now becoming so deep that we now require a ladder for access!. The image below shows the north-facing section of Trench 2, including the complex sequence of layers that have been formed. The image above shows the compact layer of sterile clay that has been spread across the deposits filling the entrance into the cave. It is possible that along with deposits below, the clay layer constitutes the formal closure of the cave entrance in the Iron Age - preventing further access to the underground passages here. The access into Bone Passage is situated at a position below the scale in the photograph, where we have just encountered a mass of larger stone containing large deposits of animal bone. 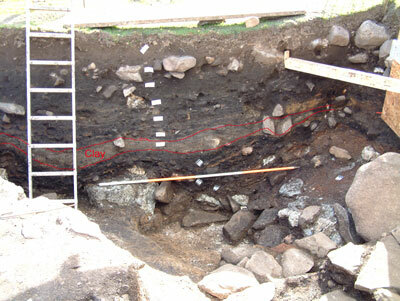 The image below shows the possible steps leading down into the hollow of the proposed entrance into the cave, and the mass of stone and rubble filling this feature. The pit feature (F204), which is situated in the SE sector of Trench 2, has also been excavated down to the natural limestone bedrock. 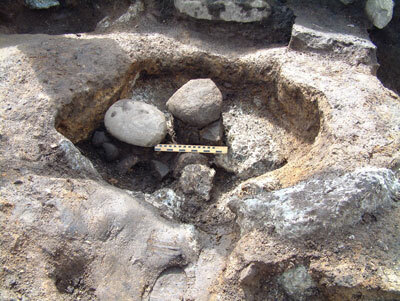 During excavation small, but well-preserved, deposits of animal bone were recovered. 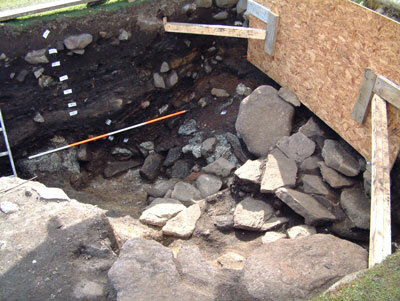 Otherwise, the only finds to be made in this large feature are a rounded granite cobble stone and a smooth granite beach pebble (see image below). These were found to be lying on a small heap of fire-cracked stone. Examination of the recovered beach pebble indicates it’s use as a large hammer-stone, while one of the surfaces shows a smooth area of polish suggesting it may have been used as some form of polishing stone or anvil. Further analysis will hopefully indicate the potential function of this item, although why it had been placed in the pit feature remains a mystery.